This outfit is definitely bolder than what I usually wear because it has way too many cut-outs. Don't believe me, wait till you check out the back. It's.... bare... Lols. Thanks to Nivea Firming and Whitening Serum range, bare-back dresses just look extra attractive these days. This is a really pretty dress, super airy, suitable for Malaysia's hot and humid weather. Also, because it's such a flowy outfit, you can eat comfortably without worrying in showing too much tummy. So much win. This is also a follow-up post on my previous Nivea first impression review. So I've been using this for about a month now, and I will have to admit, I haven't been very consistent in using this product every single night because my hands were naughty and opened up some other new products to try. 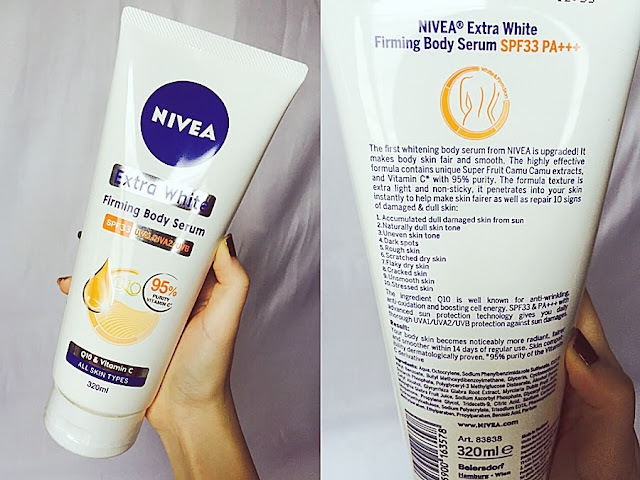 However, most days, I do apply the Nivea Extra White Firming Body Serum, if I shower, which more often than not I do shower during the day. Again, it's just a habit that I've accomplished over the years to moisturise after ever shower. Of course, with daily moisturising, my skin feels absolutely great, soft and smooth. I can't say anything about whitening but I believe in a long run, it will help with evening up my skin tone. Additionally, it has minimal SPF in it, thus, it should help slightly when it comes to "blocking" the sun. Though, I will still recommend applying sunscreen with at least SPF50 PA++++ for additional protection. I love the scent! My boyfriend loves it too! It smells great without being overpowering, it's subtle yet you know it's there. For me, when I use the Nivea Night White Firming Body Serum, it's somewhat like a calming therapeutic sleeping scent. Also, because it's serum, it absorbs into the skin easily as compared to the regular lotion. However, for those who feel that serum itself is not moisturising enough, it's absolutely normal to apply lotion after applying serum because truly, this serum sinks into the skin, it doesn't leave that layer on the surface like most lotions do. As far as for firming, I haven't seen much results. I guess it goes hand in hand with working out. This serum will probably works as a booster after your workout session. Great for people who gyms or swims, it's something you should totally throw it in your gym bag!